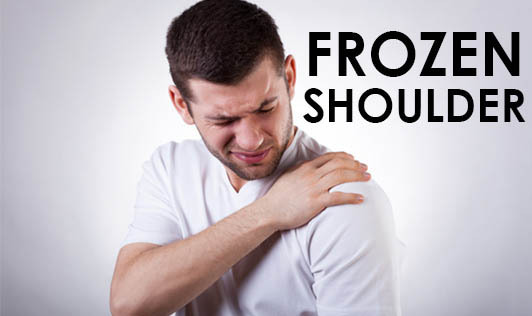 Frozen shoulder is a condition characterized by stiffness and pain in the shoulder joint with significant loss of its range of motion in all directions. The shoulder joint is surrounded by a capsule, which if inflamed, thickened or shrunken can result in frozen shoulder. Any injury to the shoulder including tendinitis, bursitis, and rotator cuff injury. Long term immobility of the shoulder joint (after chest or breast surgeries, broken arm, stroke, etc). It is seen more often in people above the age of 40. Women are more prone to suffer from a frozen shoulder than men. Diseases such as Diabetes, Cardiovascular diseases, Hyperthyroidism, Hypothyroidism, Stroke, and Parkinson's disease. It can usually be diagnosed from signs and symptoms alone. But your Doctor may suggest tests such as X rays or an arthrography or an MRI to rule out other structural problems. A common recommendation to prevent this condition is to keep the shoulder joint fully moving. Physiotherapy helps with continued movement even if the pain exists. If it is difficult to move your shoulder, ask your Physiotherapist what exercises would be best for your shoulder joint. Arthritis or the muscles around the shoulder joint can cause swelling, pain or stiffness of the joint that can mimic the frozen shoulder. Injury to individual tendons around the shoulder can limit shoulder-joint range of motion, but usually not in all directions, which is mistaken as a symptom of the frozen shoulder.